SATTAHIP, Thailand (NNS) - The guided-missile destroyer USS Chafee (DDG 90) and amphibious dock landing ship USS Tortuga (LSD 46) are in Sattahip, Thailand, supporting the 31st Marine Expeditionary Unit for Exercise Cobra Gold 2012 (CG12) Feb. 7-17. CG12 is a Thai-U.S. co-sponsored multinational, multiservice exercise that will improve the capability to plan and conduct combined-joint operations, build relationships between partner nations and improve interoperability across the range of military operations. Operations for the exercise will take place at various locations throughout Thailand. The exercise will include multiple training evolutions, a non-combatant evacuation operation exercise, a visit, board, search and seizure exercise and a mock amphibious raid. "Exercises like Cobra Gold are essential to building and maintaining relationships with our partners in the Asia-Pacific Region," said Rear Adm. Scott Jones, commander, Amphibious Force 7th Fleet. "The Cobra Gold multination naval staff training supports our combined ability to respond to crisis across a range of operations." 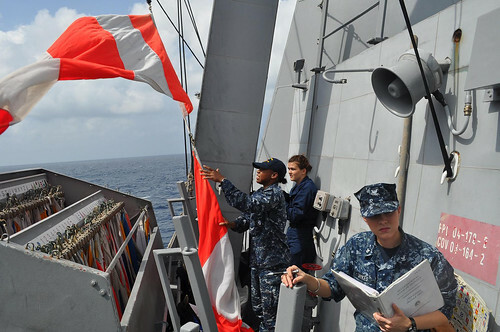 The 10-day exercise takes place ashore and in the Gulf of Thailand with more than 6,500 United States service members and approximately 3,500 personnel from Thailand, Republic of Korea, Japan, Singapore, Indonesia, Malaysia, and observers from 20 other countries. Along with Chafee and Tortuga, the amphibious dock landing ship USS Germantown (LSD 42) will join the exercise in the coming days. "Multinational exercises like Cobra Gold are crucial," said USS Tortuga Commanding Officer Cmdr. Adrian Ragland. "Exercises like this allow us the ability to train alongside our Thai counterparts to improve interoperability and further develop our cooperative relations. Not only does it allow us the ability to test our military-to-military interoperability, it also affords us the opportunity to hone our abilities to respond to humanitarian crises and disasters in the area, which as we've seen in recent history, is all too important." CG12 promotes a training environment of mutual understanding amongst international countries in the Asia-Pacific region while improving coordination and existing friendships. While international interoperability is at the heart of the exercise, it also allows for U.S. Navy units to hone their interoperability with one another. "Our Sailors are performing magnificently," said Chafee's Commanding Officer Cmdr. Justin Kubu. "Working with our counterparts in the amphibious community in support of this multi-national exercise has been a great experience and has helped to enhance our operational proficiency." CG12 is one of several exercises designed to promote peace and security in the region. This year's exercise marks the 31st anniversary of Exercise Cobra Gold. Besides the fully participating nations, several other countries have been invited to participate on the multinational planning augmentation team including Australia, France, Canada, the United Kingdom, Bangladesh, Italy, India, Nepal, Republic of the Philippines and Vietnam.